In harmony with its mission to enrich the neighbouring communities through scalable and sustainable solutions, Toyota Kirloskar Motor today inaugurated a newly constructed government hostel at Byramangala in Ramanagara district. The hostel equipped with necessary facilities is expected to benefit 60 children, thereby creating a safer environment for the schoolchildren and ensure improvement in the standards of their living. 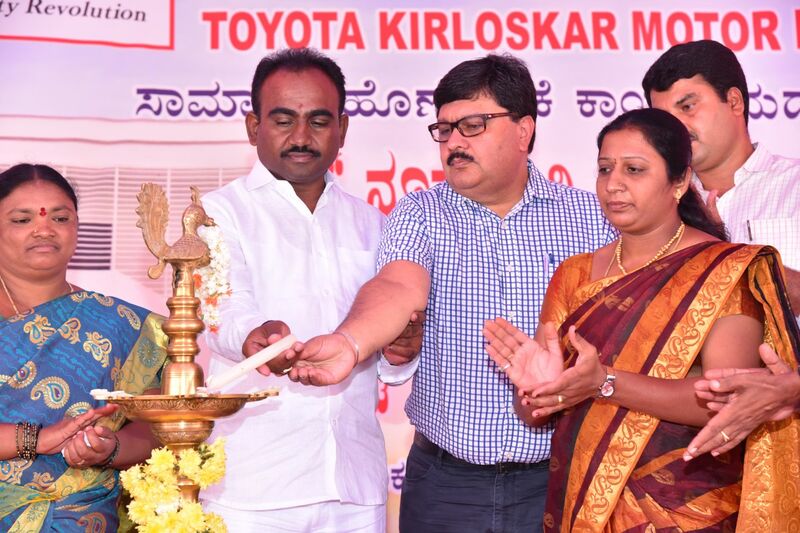 The event was inaugurated by A. Manjunath, MLA - Magadi, Venkateshamma R President Town Munciple corporation Bidadi, Gangemare Gowda, Deputy Director of Public Instruction - Ramanagara along with Naveen Soni, Vice President - Toyota Kirloskar Motor. These pre-emptive efforts taken by the company aims to help alleviate the school dropout rates, thereby bringing out a positive difference in the areas of Education. Speaking at the inaugural ceremony, Naveen Soni, Vice President, Toyota Kirloskar Motor said, “The Indian education system is hampered by multiple challenges, lack of adequate infrastructure being one of the most significant. An essential component to consider while promoting quality education is a favourable learning environment, which is entitled to each and every school going child in the country. An enriched physical as well as the psycho-social environment of the child plays a big role in defining their learning outcomes. Toyota Kirloskar Motor over the years has initiated several projects to accelerate access to quality education in the country. Recently, the company distributed school supply kit consisting of bags, books, geometry box’s, drawing books and crayons will be distributed to 22,000 students from first to tenth standards in 300 schools in Ramanagara district. This program have expanded over a period, enhancing the beneficiary coverage to around 22,000 school children this academic year, as compared to 3000 children in 2007. The company has reconstructed many government schools Yandahalli & Kupya villages in Mysore District in 2017-18, Dyavalinganapalya and Thalaguppe villages of Ramanagara District in May 2016-17, benefitting over 95 students covering 1st – 5th grades. They also constructed Ashrama School at Byramangala, LPS School at Medanahalli & Ashrama School at Hosadoddi. These projects have shown a positive impact on the school attendance ratio - with an increase from 28% to 36% in Medanahalli and 40% to 60% in Hosadoddi schools. Under the Government’s National Campaign to provide clean sanitation facilities for girl child in India, Toyota has also pledged its support to ‘Swacch Bharat – Swacch Vidyalaya’ – by constructing sanitation units at identified schools by the Government in 3 locations across India to help reduce school dropouts. The company constructed 795 units of sanitation facilities in 237 government schools across India (of which 125 units are located in Varanasi, 545 units in Ramanagara district & Bangalore in Karnataka and 125 units in Vaishali in Bihar).